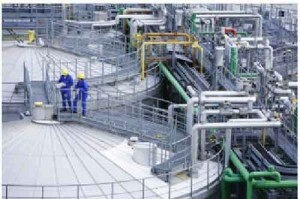 German chemical company BASF will increase its global capacities for producing the chemical intermediate 1,4-butanediol (BDO) and the BDO derivative PolyTHF (chemical name: polytetramethylene ether glycol, PTMEG) within the coming two years. BASF’s annual BDO capacity will rise from 535,000 to 650,000 metric tons, its annual PolyTHF capacity from 250,000 to 350,000 metric tons. With respect to PolyTHF, the company had already announced a capacity increase from 185,000 to 250,000 metric tons per year in August 2012.Investments are in the double-digit million euro range in order to increase capacity for BDO operations at its Geismar, Louisiana, the US site, and for PolyTHF operations at the Caojing, China, site, according to BASF. Part of the announced capacity increase will be a BDO and a PolyTHF plant located at Korla, China. As recently announced these plants will be built by two joint venture companies established by BASF and Xinjiang Markor Chemical Industry Co. Ltd. The plants will be capable of manufacturing annually 100,000 metric tons of BDO and 50,000 metric tons of PolyTHF for the local market. They are expected to begin operations in 2015. BDO and its derivatives are used for producing plastics, solvents, electronic chemicals and elastic fibers. The starting materials for the production of conventional BDO are natural gas, butane, butadiene and propylene. For 70 years, BASF has been manufacturing BDO at its Ludwigshafen, Germany, Verbund site by means of the Reppe process.